These are the final positions for this year. Congratulations to all who took part, and thank you to their clubs for supporting them. Scores are to be sent no later than the 10th of the following month. This form can be used to submit scores for multiple juniors in a club. Pennine Archers will be holding an open session for archers on the Archery GB National Talent Development Program on Saturday 2 March from 10:00 AM until 1:00 PM. This is intended to be a drop-in session at which archers on the program will have the opportunity to shoot and discuss (in collaboration with their parents/coaches) what our fully qualified performance coaches can offer, focussing on support and assistance in accordance with the National Talent Development program, which has been approved by Archery GB. Achieving the goals and improvements the program participant is expected to achieve. Scores from 23 juniors were received for November. Here's hoping for even more in December! The Northern Counties Archery Society organise an annual Junior Postal League for the winter months. Sadly, last year this didn't take place, but thanks to Ian Ashworth from Cheshire the Leagues will be running again this year. The idea is very simple and it doesn't involve juniors going outside their clubs to compete. All they need to do is put in scores for Portsmouth rounds. If you have any queries about the Leagues please get in touch with Ian. Congratulations on a great start to the indoor season for Arrowhawks athletes Niamh and Orlaith Titchener, Tom and Max Oakley, and Fin Clark, who all took first place in their age groups at the Bridlington Indoor on the 4th of November. YAA juniors are invited to take part in the YAA Juniors Indoor Postal League 2018-19. The popular YAA Junior sessions will again be taking place during the indoor season. NFP Archery, Unit 35 Colne Valley Business Park, Manchester Road, Linthwaite HD7 5QG. At all sessions there will be coaches present and available to discuss any questions which may arise. Initially coaches will be from Pennine Archers, an AGB Performance Club, other coaches are welcome to join us - please let us know if you wish to be involved. The main emphasis will be on giving juniors an opportunity to shoot together, to enjoy each other's company and to build the team atmosphere, whilst being encouraged to find their own solutions to the challenges presented. We will be asking the juniors for input into the decisions made about the activities to be undertaken. All sessions will be from 10:00 AM to 1:00 PM. Other dates may be added if there is demand. Yorkshire Archery Association has agreed to pay the venue costs for the sessions and the coaches are donating their time so there is no charge for those wishing to attend, you just need to let me know you are coming and then get there. 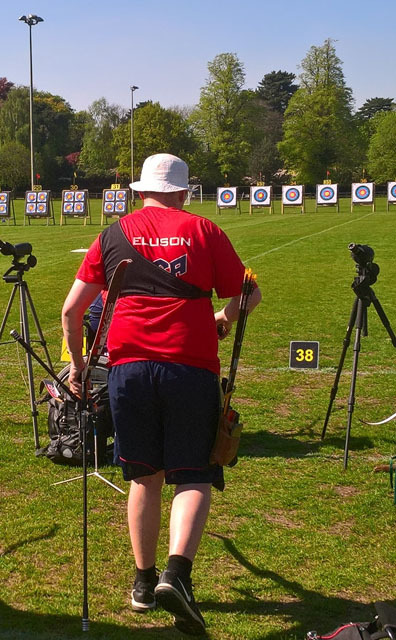 Joe Fairburn of Wharfe Valley Archers has been selected to represent the senior GB 3D team at the European 3D Championships in Sweden in September. His selection follows his successful switch to Instinctive style to qualify whilst also maintaining his recurve shooting in both WA Field and target. This reflects Joe's adaptability and puts him into a very small group (possibly uniquely) of archers who have represented GB internationally in all three disciplines shooting a recurve bow. Some fantastic results from Izzy and Adam Carpenter at the European Youth Cup, which has just been held in Patras, Greece. Great achievements and well done from the YAA. Congratulations to Izzy and Adam Carpenter of Barnsley Archery Club, who have been selected for the Great Britain team which will compete in the European Youth Championships 2018. The Championships will be held in Patras, Greece from the 26th of June to the 1st of July. Adam Carpenter of Barnsley Archery Club has set a new UK Junior record for a 720 50M compound round, shooting 698 (345/353) at the Bowmen of Glen on Saturday the 12th of May. This is an amazing achievement, especially since it's so early in the season. Congratulations from all at the YAA Adam, well done. Great shooting from Arrowhawks athlete Joe Fairburn (Wharfe Valley Archers) this weekend at the National Tour leg 1 at Lilleshall. Shooting 70m as a senior gent (rather than cadet) Joe ranked 6th on day 1 with a 631 then progressed through head-to-heads, taking Alex Wise to a one-arrow shoot-off and putting in a 10 to progress to the semi finals. There he went out to Tom Hall and shot in the bronze match against Patrick Huston, again going to a one-arrow shoot off. This time Patrick's 9 edged out Joe's 9 and he finished fourth. On day 2 he shot a 641 followed by 633 and finished with 7th place overall - plus new PBs and County Junior and Senior 720 records. Yorkshire cadet Joe Fairburn secured 4th place in the first leg of the National Tour at a sun drenched Lilleshall last weekend. Ranking 6th after qualification, Joe made steady progress through the elimination rounds beating, amongst others GB archer Alex Wise in the quarter final in a one arrow shoot off, and eventually losing out to GB archer Tom Hall in the semi final. Joe's Bronze medal match opponent was Olympian Patrick Huston who had lost to eventual winner Conor Hall. Joe took an early 4-0 lead, but Patrick pulled back to 4-4. Agonisingly, less than a millimetre denied Joe a 6-4 win as his arrow was called out of the 10 ring. This made the score 5-5, which led to a one-arrow shoot-off. Both shot 9s, but Patrick's was closer to the centre giving him the podium spot. It was an excellent weekend all round for Joe as he followed it up on the Sunday with a 641 and 633 at 70m in the Staffordshire Bucks or Bounty. Not only did this give him two personal best scores (single and double 70m 720), but also 2 new county records, 2 new Northern Counties records and the win in the senior 'Bounty' section of the competition. Well done Joe for a sparkling performance. There was a small idea of organising something that got junior archers together in one place to do some shooting. The idea progressed into thinking it could be a regular thing over the winter. Then on 28th October 2017 the first session happened! We had thought we might get perhaps 12 juniors attending, but the numbers who wanted to come kept growing and on the day 20 juniors arrived at the Pennine Archers indoor range with parents and other supporters. Suddenly the range seemed very busy, but there was also a lot of nervousness and excitement mixed in. Following an energetic warm up we shot some arrows and scored them, archers talked to each other, archers talked to coaches and helped them with the scoring, coaches talked to archers, parents talked to each other, and to archers, and to coaches. Then it went quiet as the archers started to think about and write down their expectations of the sessions, but not too quiet as they were still talking to each other. The coaches were told by juniors and parents that juniors want to shoot, have fun together, play games (and they gave us some new ideas to work on for next time), learn more about preparing for competitions and have a bit of coaching at the same time! The quiet didn't last long though - an archery team game came next... Working in teams organised by the coaches on the basis of the scores already achieved meant getting to know new people and planning a strategy together. The final result, after a close fought contest, was a draw between The Spooks and Team I Don't Know. On to Team Head-to-Heads to end the session. This time we had three winning teams: The Spooks, Team I Don't Know and The Three Archertiers. Congratulations to the winners who fought through some very close matches and fought off The Pumpkin Archers, Team Rebels and The Dinos, sometimes only winning the set by 1 point! And then home for lots of tired archers! The juniors told us they had a lot of fun shooting and meeting new people. They enjoyed working with different people and trying some new things whilst getting some hints and tips to help them improve their performance. They also gave the coaches some ideas and things to think about for the next session on 18th November. A huge thank you must go to all the parents who brought the juniors, some having set off quite early to get to Linthwaite, and to the coaches who came to help. Without them the session couldn't have happened. Thank you also to the juniors who made it such an enjoyable morning. And finally thanks to the YAA Committee for supporting the idea and making it possible. to book your place. If any coaches from other clubs want to become involved at the sessions please can they use the same email to let me know so that we can include them in the plans. We are working on ways to make more places available which may include running the session twice on the same day (one morning, one afternoon) so that people can choose which one to attend. At all sessions there will be coaches present and available to discuss any questions which may arise. Initially coaches will be from Pennine Archers, an AGB Performance Club. However the main emphasis will not be on the coaching but on giving juniors an opportunity to shoot together, to enjoy each others' company and to build the team atmosphere. There will be at least one session each month during which we may shoot a scoring round, include a variety of Archery Games, team building and other archery related activities. It is hoped that the juniors will lead some of the decision making relating to the activities undertaken. Sessions will be from 10:00 AM to 1:00 PM. If other coaches want to become involved they only need to contact me to arrange this. Rosie Elliot of Chantry Bowmen broke her own national record of 305 points that she set last year. She scored an extra 41 points to claim a new record of 346 at the Croesoswallt Double American on Sunday the 3rd of September. She attained the score in the first American round. Archery GB has published the submission form for 2017 junior rankings. We would love to see loads of submissions from Yorkshire's juniors. Yorkshire's juniors put in some barnstorming performances at the Junior National Outdoor Championships 2017. There'll be a full report in the next newsletter, but here are some highlights. Rosie Elliot of Chantry Bowmen dominated with her longbow, outscoring all other longbow archers in all categories. She won the Junior Ladies U14 Longbow title by a huge margin. Orlaith Tichener of Archers of East Riding won silver in the Junior Ladies U12 Compound category. Megan Tinker of Dearne Valley Archery Club won bronze in the Junior Ladies U18 Recurve category. Joe Fairburn of Wharfe Valley Archers won the Junior Gentlemen U16 Recurve title against strong competition - see the next story. Thomas Oakley of the Bowmen of Adel won the Junior Gentlemen U16 Barebow title. Maxwell Oakley of the Bowmen of Adel took third place in the Junior Gentlemen U12 Barebow category. The Yorkshire Recurve team achieved the second-highest score since 1965. Congratulations to them and to all the other Yorkshire juniors who took part. Joe Fairburn of Wharfe Valley Archers had a highly successful 2017 Junior National Outdoor Championships at Lilleshall at the weekend. On Saturday in the Metrics he finished 2nd in the individual Metric 2 and 1st in the team event helping to secure NCAS the recurve title. On Sunday he won the Bristol 2 with a national record score of 1268. This was shot during intense competition with never more than 2 points separating him and his closest rival over the 144 arrow round. He was also one of the team that won the recurve trophy for Yorkshire for only the 8th time in 52 years. This tournament capped off an incredibly successful five weeks of archery in which Joe has broken six national records across both target and field archery, claimed two national individual titles and two national team titles. Isabelle and Adam Carpenter of Barnsley Archery Club have been selected for the Great Britain team which will compete in the second stage of the European Youth Cup. The tournament will be held in Porec, Croatia from the 9th to the 14th of July. Adam will shoot in the Compound Cadet Men category, and Izzy in the Compound Junior Women category. This has been achieved against extraordinarily strong competition for places. Congratulations and best wishes to them from all at the YAA. Congratulations to Joe Fairburn on his outstanding shooting in the All British Field Championships at Pentref this weekend - 3 strong PBs and a new national record, beating Patrick Huston's record by one point! Well over the selection scores for the Europeans in Slovenia! fingers crossed for that selection. Joe Fairburn (15) of Wharfe Valley Archers, became the U18 British Junior Field Archery Freestyle champion last weekend shooting a National record score of 343 on the marked round, beating Patrick Huston's existing record. Joe's two day score was less than a dozen points off the men's podium as well as another European Championships qualification score. Excellent performances from Yorkshire archers, all in Kath's Academy coaching group! Niamh Titchener ranked top of tier 3, then took individual Gold in the Tier 3 Cadet girls 720 and H2H, and mixed team Gold in the Cadet event alongside team mate Piers Skilton. Megan Tinker ranked 5th in the Junior Ladies tier 1 event, took the Silver in the triple team event alongside Jodie Green and Lauryn Jewkes, Bronze in the mixed team alongside Ryan Pinder. A NCAS success also in Kath's group, Kieran Shirley from St Helens (NCAS) also fared well taking Silver in the Cadet mixed team, shooting against training partner Niamh Titchener and Piers Skilton, then taking Bronze in the Cadet Boys tier 2 event and individual Bronze in the Cadet Boys individual tier 3. Good solid performances from a developing team and a very happy Coach! Well done to Joe Fairburn and Megan Tinker for winning the gents and ladies eliminations at Daventry Field shoot on Sunday the 14th. Both shot the full round at adult distance then went into the shoot-offs in the adult categories. Excellent performance from our two leading Field juniors! Adam Carpenter of Barnsley Archery Club has won team gold for Great Britain at the European Youth Cup in Marathon, Greece. The compound cadets team of Adam, Liam Peake and Kai Thomas-Prause won through to the final against the home nation. GB opened very strongly with three Xs and three 10s in their first end, and held the lead to the end, despite a strong comeback by Greece. GB won by 224 points to 213. Congratulations to Adam and his team mates on this superb victory. Yorkshire's juniors had mixed fortunes at the Key Event 1 for World Youth Championships Selection, which took place at Lilleshall on the 15th and 16th of April. Ben Daniel won Recurve Cadet Men Tier 3. He qualified in second place, and shot a brilliant head-to-head to win his category. With Rhiannion Easton he finished third in the Mixed Team. His Cadet Men's team qualified in top place and went on to win gold. Niamh Tichener qualified in fourth place in Recurve Junior Women Tier 3. She had a difficult head-to-head, but finished in 5th overall. Her mixed team qualified in third but finished in fifth. She did better in the cadet women's team event though, qualifying in first place and finishing in second. Megan Ashleigh Tinker of Dearne Valley AC qualified in fourth place in Recurve Junior Women Tier 1, with a personal best at 70 metres. She was knocked out in a very close head-to-head, finishing 5th overall. Her mixed team finished fourth, but her girls team won gold. Joe Fairburn had a tough time in Recurve Cadet Men Tier 1. He qualified in 4th place with a very good score of 592 - just 6 points off the top place. But he had a difficult head-to-head and, despite winning several matches, finished 8th overall. Congratulations to them from the YAA. This weekend sees Key Event 1 taking place at Lilleshall - the first of four events throughout the year aimed at the country's best junior archers. The events aim to give the archers the experience and skills of a full international event with Individual, team and mixed team events taking place at each stage. Good luck from all at the YAA. Isabelle Carpenter of Barnsley Archery Club will represent Great Britain at the European Indoor Championships which are to be held at Vittel in France from the 5th to the 13th of March 2017. Izzy will be part of Team GB's strong-looking Junior Compound team, alongside Bayley Sargent, Layla Annison, James Howse, Luke Ralls and Jacob Caine. Compound Coach Jon Nott said: "By taking a highly experienced and competitive team I believe we are definitely in the hunt for medals". Best wishes to Izzy from all at the YAA. Rosie Elliott of Chantry Bowmen became National Junior Ladies Champion at the Junior National Indoor Championships, which were held at Lilleshall in early December. Shooting longbow, Rosie scored 410 on a Portsmouth round, a personal best and a Yorkshire record. In achieving this score, Rosie became the U14 Champion and also the National Junior Ladies Champion - her total was more than any other age group competitor, including the junior men. YAA President Andrew Neal said "This is an excellent achievement and rounds off a magnificent calendar year Rosie has had with her longbow. On behalf of the YAA and all Yorkshire archers, I'd like to congratulate Rosie." Adam Carpenter of Barnsley Archery Club smashed a national record at the Inter Counties shoot on Saturday the 1st of October 2016. He scored the maximum of 1296 points on a Bristol 2, shooting compound. Congratulations to Adam on this brilliant achievement. I have one space available at the Junior Inter Counties event, which will take place this coming Saturday, the 1st of October. The shoot will be hosted by the Bowmen of Pendle and Samlesbury near Preston, Lancashire. I am taking applications from all bow styles and genders. If possible, please provide evidence of scores from 12-dozen rounds. It's that time of the year again! Summer is nearly over and our thoughts turn to the indoor season. This year the Perris Archery Junior Indoor League is in its 5th year, with clubs from around the country showing interest in joining the league. The league is based on a half-Portsmouth round - 30 arrows at 20 yards, on a 60cm face target. Each recurve team consists of 3 archers, each compound team consists of 2 archers. This year we hope to increase the number of teams. There is no fee for entering as the trophies are sponsored by Perris Archery. So the competition is ideal to keep the juniors motivated over the winter months from October to March. Could you please confirm if your club will be entering any teams this coming year. The deadline for entries will be Friday 23rd September 2016. Archery GB would like to offer all aspiring Olympic Archers under the age of 20 the opportunity to engage with our National Talent Development Programme for 2016-2017. Archers who are currently within the 2015-2016 group or who have engaged previously WILL need to sign up again. Athletes will be invited back to Lilleshall once every three months at £10 per session to be assessed by our Talent Team Coaches - athletes are expected to attend all sessions. The Programme is athlete led: it is the athletes' responsibility to take as much information from the coaches as they need to direct their training. This allows athletes to develop in their own way and time without expectations from Archery GB, who are here for support and encouragement. "This programme affords an incredible amount of flexibility to young athletes. It puts them at the heart of our Pathway, whereby they develop autonomy and can take their talent in a direction that feels right for them." The entry fee for registration is £15 per person. Yorkshire's junior archers have achieved brilliant results at the Junior National Outdoors Championships 2016, which were held on the 2nd and 3rd of July. Metric rounds were shot on Saturday. In Junior Gentlemen Compound, 13 year old Adam Carpenter (Barnsley AC) won his category, shooting the senior men's distances - 90m, 70m, 50m and 30m. He scored 1328, which was 42 points higher than the top scorer on the 70-60-50-30 distances. Isabelle Carpenter (Barnsley AC) finished second in Junior Ladies Compound, with a score of 1299 on the Ladies WA 1440. Joe Fairburn (Panda Bowmen) won gold in the Metric 2 Junior Gentleman Recurve category with a score of 1263. His score helped the NCAS Junior Gentlemen Recurve team to win the regional title. Megan Tinker (Dearne Valley AC) finished fourth in the Metric 2 Junior Ladies Recurve category with a score of 1121. Alyssa Barraclough (Dearne Valley AC) finished fifth in the Metric 4 Junior Ladies Recurve category with a score of 1245. She was part of the NCAS Junior Ladies Recurve team, which took fourth place. Hannah Stocks (Danum Junior Archers) won bronze in the Metric 4 Junior Ladies Compound category with a score of 1331. Imperial rounds were shot on Sunday, for the national titles. Hannah Stocks (Danum Junior Archers) won bronze in the Bristol 4 Junior Ladies Compound category with a score of 1276. Catherine Dales (Bowmen of Leeds) won silver in the Bristol 2 Junior Ladies Compound category with a score of 1196. Megan Tinker (Dearne Valley AC) finished fifth in the Bristol 2 Junior Ladies Recurve category with a score of 1121. Joe Fairburn (Panda Bowmen) won silver in the Bristol 2 Junior Gentleman Recurve category with a score of 1246. Isabelle Carpenter (Barnsley AC) won gold in Junior Ladies Compound, with a score of 1268 on the Hereford round. Adam Carpenter (Barnsley AC) won gold in Junior Gentlemen Compound, with a score of 1248 on the York round. Yorkshire finished third in the County Mixed Recurve Team category thanks to scores from Alyssa Barraclough, Elizabeth Ferguson, Catherine Dales and Joe Fairburn. Yorkshire finished second in the County Mixed Compound Team category thanks to scores from Hannah Stocks, Isabelle Carpenter and Adam Carpenter. Congratulations to them all, and to the other Yorkshire juniors who took part in the biggest and best JNOC ever! Isabelle and Adam Carpenter of Barnsley Archery Club have put in exceptional performances at the first leg of the European Youth Cup, which was held in Hungary in early May. Izzy set a new UK record of 144 for Junior Lady Compound 15 Arrow Pass. She and her team mates Layla Annison and Hollie Smith went on to win gold against Italy in the Compound Cadet Women's Team final. Adam won the Mixed Compound Team silver with Lucy Mason. He then beat Teodor Vlad (Romania), Kritjan Puusepp (Estonia) and Sebastien Osnowski (Belgium) to earn a place in the Individual Compound Cadet Men's final. He and his opponent Sune Rasmussen (Denmark) started level, but Rasmussen opened up a narrow lead, then finished with a perfect end to claim gold. Congratulations to Adam and Izzy on another brilliant performance! Megan Ashleigh Tinker won the English Field Archery Championships and the Northern Counties Field Archery Championships at Kendal last weekend. Megan, of Dearne Valley Archery Club, scored a total of 442 points over the two days in very wet conditions on a tough course. These titles add to the UK and Yorkshire titles that she already holds. Outstanding shooting - congratulations to Megan from all at the YAA. Isabelle Carpenter and Adam Carpenter of Barnsley Archery Club have been selected for the Great Britain compound team which will take part in the European Youth Cup. The tournament will be held in Budapest, Hungary from the 2nd to the 7th of May. This is an outstanding achievement against very strong competition. Best wishes to them both from the YAA!